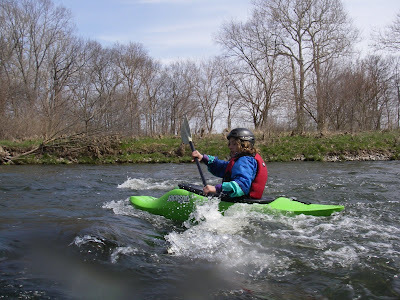 After a winter of paddling mostly indoors, it's exciting to get out on the lake and rivers again. 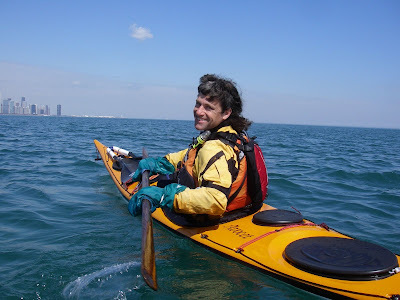 We've paddled on Lake Michigan several times already this year. The water is still cold (about 44 degrees), but if you dress appropriately, it's not unsafe. In fact, it's warm enough now that even Sharon is willing to roll and practice rescues. (She draws the line at about 42 degrees.) That's a sure sign of spring. 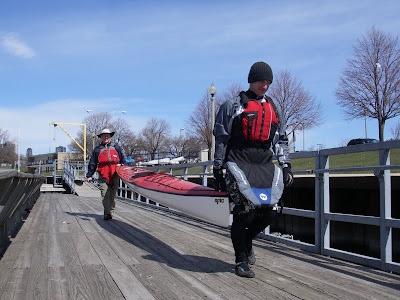 And there are plenty of benefits to paddling on cold water: there's almost no boat traffic on the lake, the water in the harbors is still pretty clean, and the rivers tend to have nice currents and features. Jeremy surfing a small wave on the "Mighty" DuPage. This variety of padding is great for skill development. Here in the midwest, where we have no tides, river paddling allows us to experience currents and even small versions of tidal races. 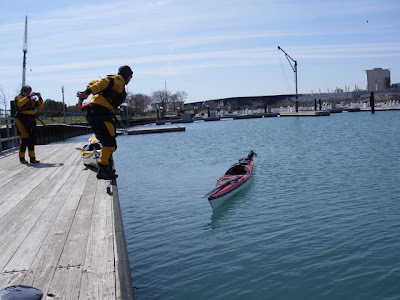 We can't eddy out from behind headlands on Lake Michigan, but we can practice that maneuver on rivers. 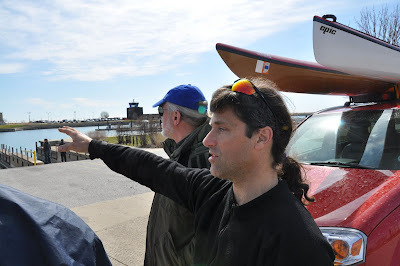 The only ferrying we can do on Lake Michigan is in response to the wind, but we can practice ferrying to compensate for current on the rivers. 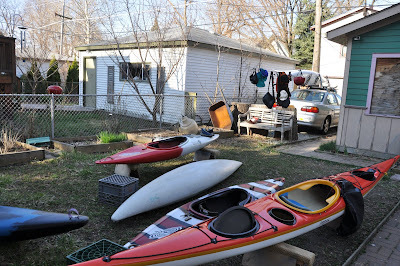 We thought about this last benefit on Friday, when we paddled into gusts of 25 to 30 miles per hour on the lake. 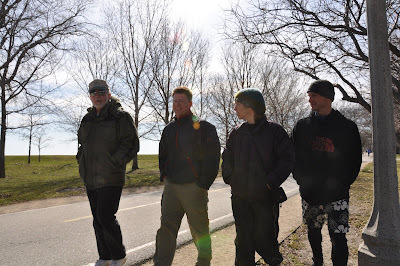 The wind was out of the south and we were attempting to paddle southwest. If we headed slightly east, we ferried east; if we headed slightly west, we ferried west. The feeling was familiar because we had spent time ferrying on river currents. There are many reasons to train in multiple paddlesports. That's why the British Canoe Union (BCU) requires coaches to be proficient in more than one discipline. Individual skills may not translate exactly from one paddlesport to another, but the combined knowledge base definitely augments your overall skill, comfort and enjoyment of paddling. It's good to be back on open water.